Pioneer Industrial Systems is expanding its portfolio of tire industry solutions with systems for conicity striping and high point marking for OEMs. A number of OEMs use the tire conicity results to match sets of tires for use on new vehicles. The tire is cured and measured for force variation and the results determine the conicity striping protocol, but there is no industry standard for the number of stripes and the colours. Pioneer has therefore developed a system that connects to the data source, reads the barcode of the tire and has the flexibility to paint the required stripes. 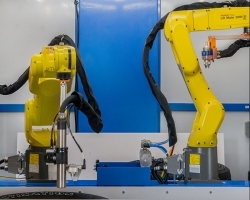 The company has developed several designs that integrate into the tire manufacturing process, ranging from standalone cells that paint tires individually to systems placed in the flow path that paint a stack of tires. High point marking is another OEM requirement, so that wheel-tire assembly uniformity can be optimised by offsetting effect of the tire and rim. Pioneer’s system can automatically read a barcode with this information to paint a mark on the tire. This solution can be integrated into Pioneer’s finished tire systems such as the conicity striping and white sidewall protective spray operations.